We’re officially out of the holiday season. I could be kind of sad about all the sparkle of the season coming to an end. 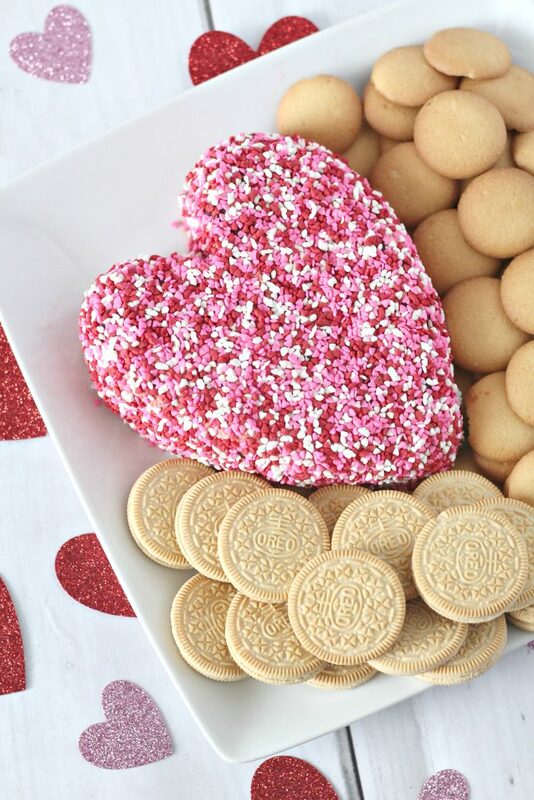 Or I could carry on and make you delicious holiday themed desserts for Valentine’s Day. I chose the latter. 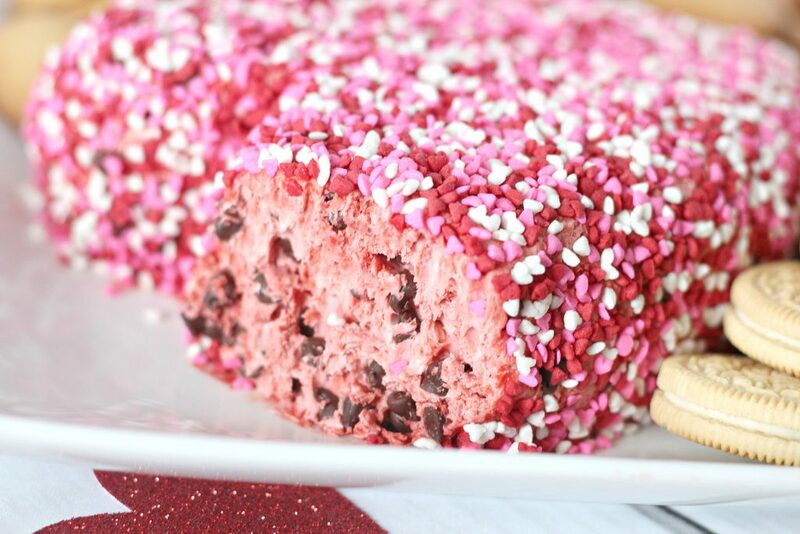 Well this red velvet chocolate chip cheesecake cheese ball takes my love of fun, festive cheese balls and makes it current for Valentine’s Day. Or really any time you want a gorgeously pink cheese ball in your life like for a tea party or bridal shower. 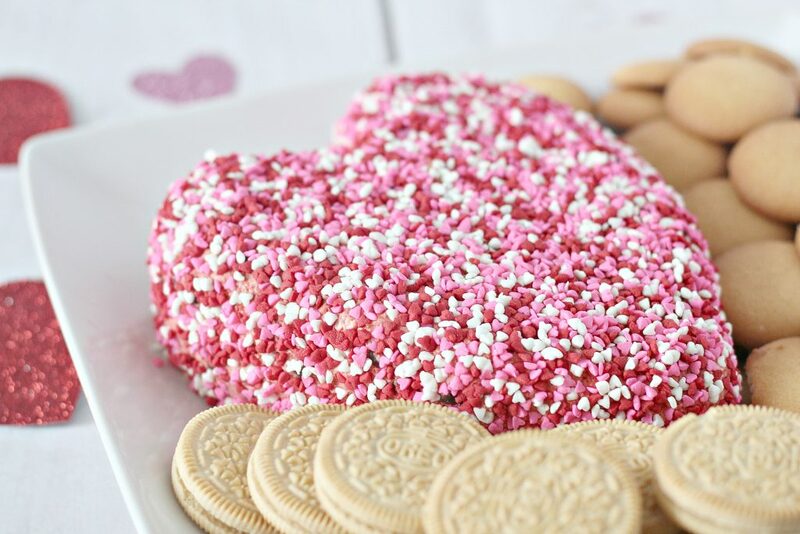 It would be a fun themed addition with its heart shape, pink color, and of course the little heart sprinkles. 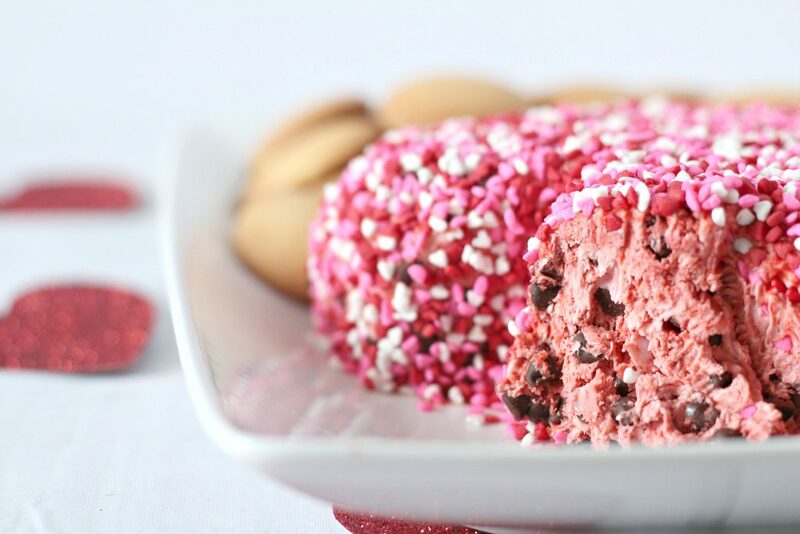 While, yes, the sprinkles are optional, I don’t recommend leaving them off because they just make this red velvet chocolate chip cheesecake cheese ball something even more special than it already is and let you theme this cheese ball to suit your occasion. 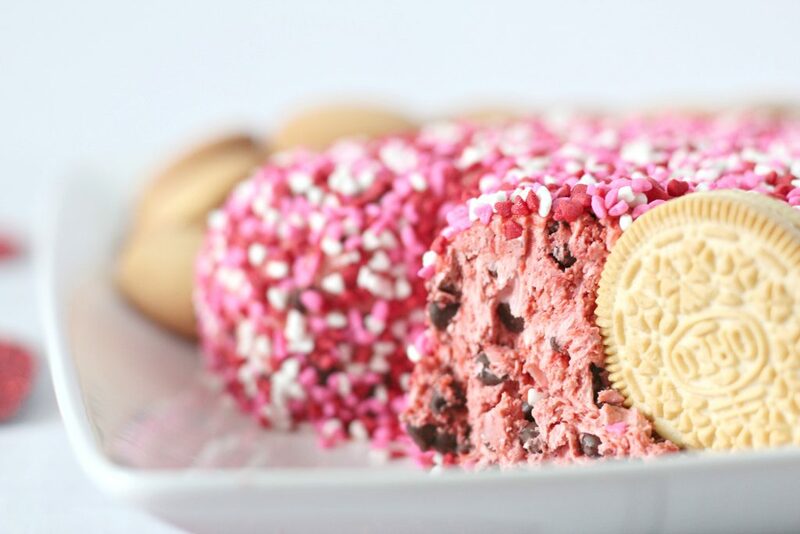 You could even switch up the sprinkles and make this red velvet chocolate chip cheesecake cheese ball for Christmas with red and green sprinkles and maybe a few drops of red food coloring or for Easter with springtime sprinkles. Part of my love for all cheese balls comes from how easy they are to make. There is no baking required and no hard to find ingredients or special equipment. You only need cream cheese, red velvet cake mix, chocolate chips, powdered sugar, butter, and sprinkles. And all you need to do? Add the ingredients into a mixing bowl and knead them all together with your hands until they form a dough. Then come the fun parts. You get to play with the cheese ball to flatten it out and make it into a heart shape. 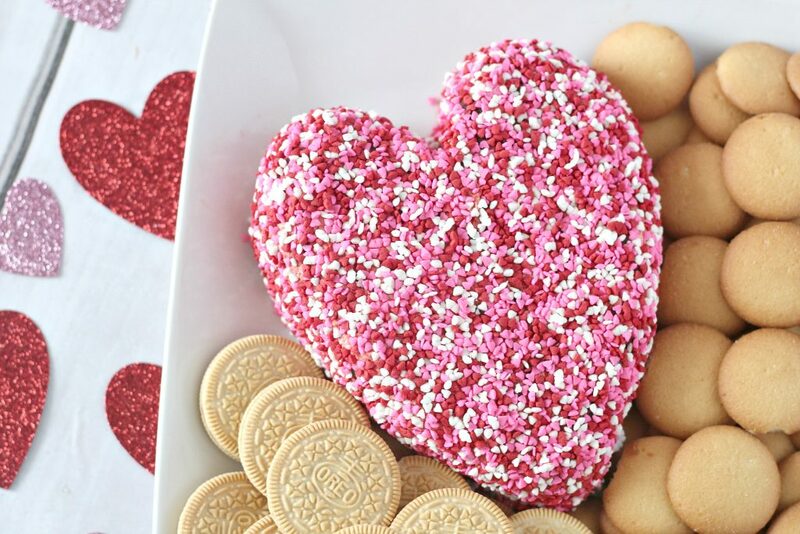 After you form the heart, you get to coat it with all the festive sprinkles. Lastly, the cheese ball just needs to chill in the fridge for 3 hours or so until it’s firm and set. And then it’s time to enjoy. Choose whatever dippers you’d like but I am partial to Golden Oreos or Nilla Wafers. 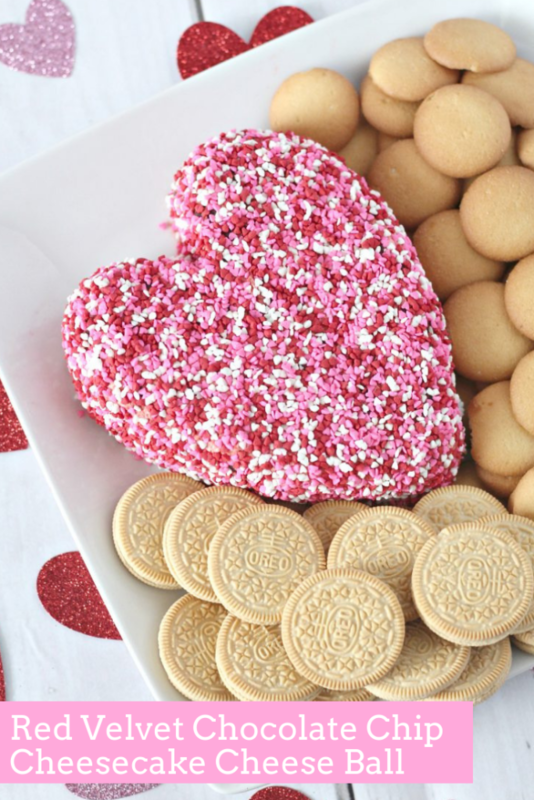 Both are perfect in this Valentine’s Day dessert. Start by placing all ingredients (except sprinkles) into a large mixing bowl. Knead with hands and mix well until well combined. Roll into a ball and place on a plate. Flatten with palm of your hand and mold into the shape of a heart. Sprinkle entire cheeseball with sprinkles, until completely covered. 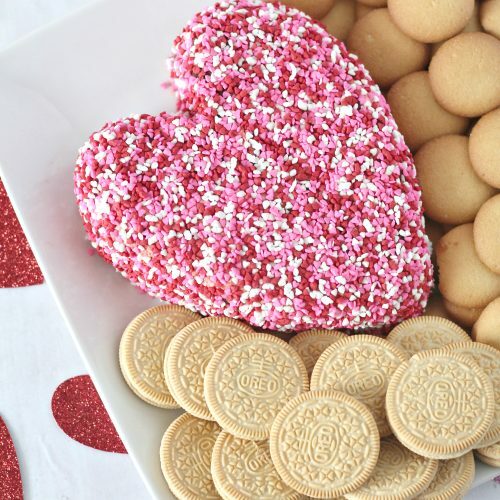 Serve vanilla wafers or golden Oreos and enjoy! RSS. I don’t understand why I can’t sibscribe to it. Is thwre anybody else getfting similar RSS problems? This is so fun and sounds yummy too!